Cobblers boss Justin Edinburgh believes his players are prepared and ready to go ahead of Saturday’s season opener at Shrewsbury Town (ko 3pm). But the Town manager has also warned the club’s supporters the the squad’s ‘excellent preparation’ doesn’t guarantee the team will hit the ground running at the New Meadow. 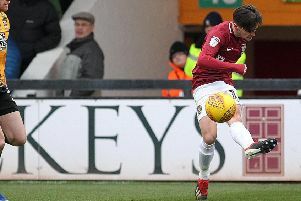 Edinburgh has made huge changes to the Sixfields squad, releasing a host of first team regulars at the end of last season, and then signing a dozen new players this summer. Pre-season has gone well, with injuries kept to a minimum, and the team losing just one friendly in 90 minutes, a 2-0 defeat at AFC Rushden & Diamonds which came less than 24 hours after a trip to Somerset to play Frome Town. But Edinburgh is wary of the fact that he is putting together a new team, and knows only too well that sometimes things don’t click straight away when that is the case, but he is confident in the long term the Cobblers will be a force to be reckoned with. “It has come round very quickly,” said Edinbugh ahead of Saturday’s trip to Shropshire. “But we feel we are ready. “The preparation has been excellent, and as I have said before the players’ attitude and application to pre-season has been first class, so I am absolutely delighted with that. “I am mindful and cautious that we are still bedding in 12 new players, and as much as we have a desire and want to hit the ground running, that may not be the case. Town will be hoping to get off to a winning start against the Shrews. On paper Paul Hurst’s men are not one of the division’s big-hitters, but Edinburgh insists that does not make his team’s opener any less difficult than if they were taking on one of the promotion favourites. “At this time of the season, there is no form,” said the Cobblers boss. “There is nobody going into a game on any kind of run, so I think until you get 12 games in no-one will feel they are less expected to win a football match. “I believe it is going to be a tough encounter. “Shrewsbury have had a very good pre-seasan, and a bit like ourselves they have brought a lot of new faces in. “The manager there had the latter part of last season to assess and look at the squad, and he has been able to put his own stamp on that now, a bit like myself, and I don’t envisage this is going to be any less difficult than if we were playing Blackburn, Wigan, Portsmouth or whoever.